Bitcoin has begun trading on a major exchange for the first time. The digital currency launched on the CBOE futures exchange in Chicago at 23:00 GMT Sunday, allowing investors to bet on whether Bitcoin prices will rise or fall. Its value had surged in the run-up to its futures debut, which saw it rise another 17% to above $18,000. Bitcoin's introduction to the CBOE has been seen by some as a step towards legitimising the currency. The move is expected to be followed next week by a listing on the rival Chicago Mercantile Exchange. Bitcoin: Risky bubble, or the future? CBOE trading saw the Bitcoin futures contract expiring in January start at $15,000 before rising to above $18,000. The contract is based on the price of Bitcoin as quoted on the Gemini exchange. The Gemini exchange was set up by the Winklevoss twins, who were early fans of the crypto-currency and who have been called the first Bitcoin billionaires. A CBOE insider said its start was low key, with "no champagne". However, CBOE tweeted to warn that its website was running slowly and could be temporarily unavailable. Anticipation of the first mainstream listings have helped the controversial currency soar past $10,000 and then over $17,000 on Thursday before retreating. 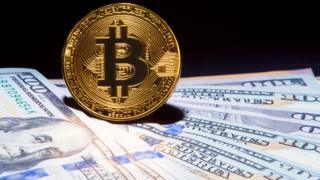 The price of Bitcoin stood at about $16,600 on Monday, according to Coindesk.com. Futures are typically based on the price of a real commodity - such as oil. One of the controversial aspects of Bitcoin is that some do not see it as a "thing". Although it is called a currency, it can be argued it is an asset, or commodity, without any actual use or real assessable value. Nick Colas, of Data Trek research, said the futures listings gave Bitcoin "legitimacy - it recognises that it's an asset you can trade". Chris Ralph, chief investment officer at St James's Place told the BBC's Today programme that he remained cautious about the currency. "I refuse to use the word legitimate, but it's probably moved out of the shadows into the open," he said. "But what I think it means is more people in the conventional investment banking market will take a look at Bitcoin. "It has been described as the asset class of 2017 but when we went into the year no one would have called it an asset class." Bitcoin futures will make it easier for more investors to buy the crypto-currency, by removing the need for them to set up a special digital Bitcoin wallet. Sceptics argue that the CBOE futures will simply draw more naïve investors into perpetuating a bubble in a financial asset that Nobel economist Joseph Stiglitz has accused of having no intrinsic value beyond supporting money laundering and tax avoidance. And there is something else that anyone placing big bets on the futures market may want to think about. The eventual payout on their futures contract depends on the auction price at the separate Gemini exchange of the Winklevoss brothers. Are they confident that the auction price cannot be manipulated, in the same way that Libor and regular currency derivatives have been in the recent past? The CBOE and CME launches were made possible following approval by the US Commodities and Futures Trading Commission (CFTC). However, the regulator has warned investors about the "potentially high level of volatility and risk in trading these contracts". The Futures Industry Association, which includes some of the world's biggest derivatives brokerages, has criticised the CFTC's decision, arguing that insufficient attention has been paid to the risks involved. Bitcoin is not regulated by any country's central bank and has no universally recognised exchange rate. CBOE rules suspend trading if Bitcoin prices rise or fall by 10%, in an attempt to reduce wild fluctuations. They kicked in twice in this first session. "We are committed to continue to work closely with the CFTC to monitor trading and foster the growth of a transparent, liquid and fair Bitcoin futures market," CBOE said.